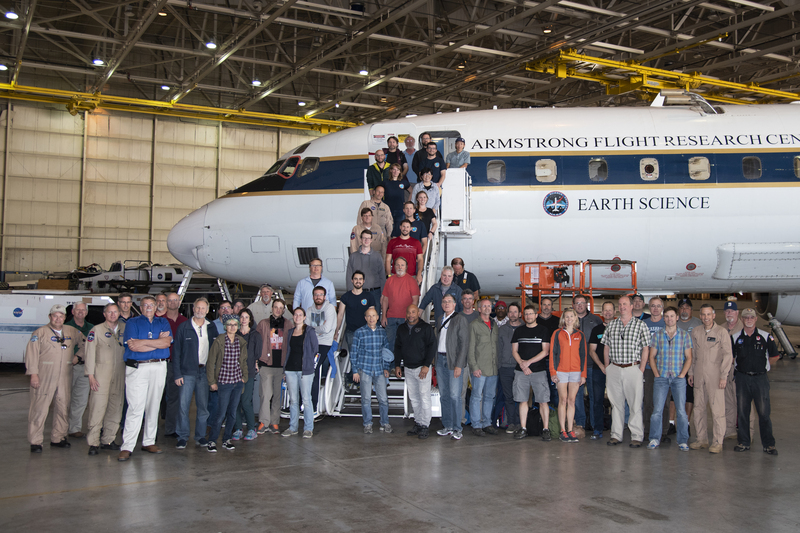 The ATom team that was onboard and onsite when the NASA DC-8 returned to the NASA Armstrong Flight Research Center (AFRC) in Edwards, California on 21 May 2018. The NASA Atmospheric Tomography Mission (ATom) completed its fourth and final deployment on 21 May 2018. The ATom flights used the NASA DC-8 aircraft to systematically measure atmospheric composition in a cross-section of the atmosphere between 500 feet and 40,000 feet altitude while traveling from the Arctic to the Antarctic, over the Pacific and Atlantic oceans, in all 4 seasons. Each deployment circuit comprised 13 flights and covered approximately 78,000 km. Two circuits included an additional flight over Antarctica from Punta Arenas, Chile. 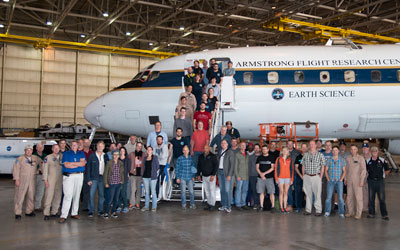 The payload of 28 instruments included 13 from the NOAA ESRL CSD and GMD laboratories. ATom excelled in achieving its science objectives of comprehensive and statistically robust sampling of long-lived and reactive gases, aerosols, and radiation in the background remote atmosphere that will offer otherwise unobtainable constraints on chemical processes related to the short-lived climate forcing species ozone, methane, and black carbon soot. In addition, ATom was also a "voyage of discovery" in many ways, detecting unexpected new chemicals emitted from the ocean surface, and uncovering the birthplace of new aerosol particles high in the atmosphere. ATom is an outstanding cooperative project amongst federal agencies and universities that has provided unique global-scale data to challenge and improve our understanding of our present and future atmosphere.